Hmm…I did not know that there was a National Capuccino Day on November 8th. A little friend sent me an e-mail and told me that you could get Free capuccino on Tuesday only at Saquella Cafe in Boca Raton and at Prosecco Cafe in Palm Beach Gardens. Both restaurants are owned by Chef Avi Sekerel. They feature yummy baked goods, refreshing salads, inventive sandwiches, flat breads, wonderful gelatos and a variety of entrees, as well. 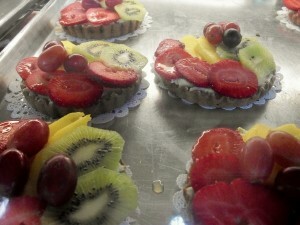 Saquella is located at Royal Palm Place, 410 Via de Palmas, Boca Raton, Florida. Tel. 561-338-8840. 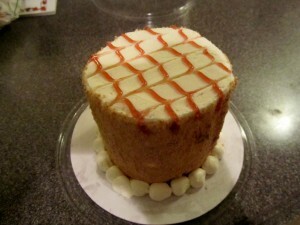 Like it on Facebook at facebook.com/saquellacafe. 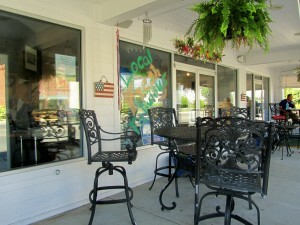 Prosecco Cafe is located at PGA Commons, 4580 PGA Blvd., Palm Beach Gardens, Florida. Tel. 561-622-3222. Like it on Facebook at facebook.com/proseccocafe. To get a free cappuccino, at either restaurant on November 8th, diners just need to come in, that day, and say “I love Capuccino”. You can receive one cappuccino from 7 a.m. until 10 p.m. Additionally, diners can join the VIP Club, for either or both of these restaurants, by texting the word Saquella or the word Prosecco to 91944, to receive special offers, like the free cappuccino, on their phones. The word Cappuccino, means little hood in Italian. The cappuccino was first created in Italy. This soul-satisfying coffee drink is derived from an Italian order of monks, known as the Capuchins, whose hoods resembled the drink’s frothy color and shape. It is prepared with espresso, hot milk and a topper of froth. 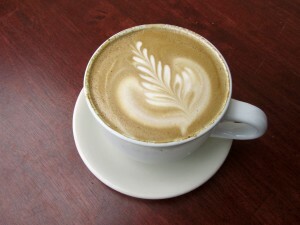 Cappuccino is enjoyed throughout the day or evening. This promotion from Chef Avi is a way to say thank you to all of the loyal customers, as well as hello to all of the cappuccino enthusiasts in the community. Please note that both of these restaurants are proud of being No Fry Zone and everything is made from fresh, high quality ingredients with an emphasis on local purveyors. So…if you decide to go let me know how that cappuccino was…..thanks to Sharon for your information regarding this promotional event. Have a good one…talk to you later….I do love cappuccino…in the evenings, I get a decaf. By the way, like AboutMyBeaches on Facebook, while you are at it. Thanks!! I thought it would be hard to go and review an eatery that is owned by friends. You know how it is, you are a little apprehensive. You never know how service/food are going to be on a specific day. 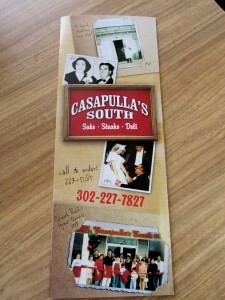 Except at Casapulla’s the service and the food have been consistent through the years. They have plenty of experience. In business since 1956. 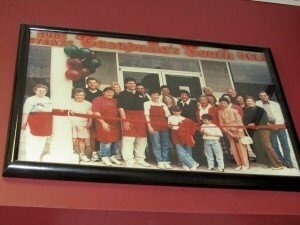 Luigi Cassapulla was the Italian immigrant and patriarch of this family. His story so interesting; vision, hard work, supportive wife and plenty of kids. Luigi was Paula’s grandfather. 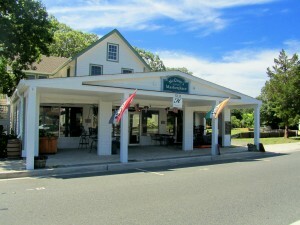 Paula and her husband, Mike, opened in Sussex County in 1984. But, they have been at Lighthouse Plaza on Rt. 1 in Rehoboth Beach since 1997. The tel. is 302-227-7827, or, if it is easier for you to remember then, 227-subs. Website? 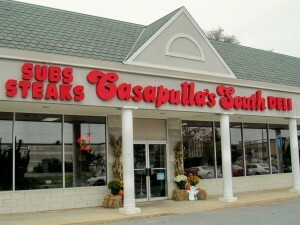 www.casapullassouth.com. I was thinking that subs are so versatile. They travel well; perfect for gatherings and at this time of the year; Monday Night Football. So, I found out that subs originated in Italian American communities in the northeast; around the late 19th to mid 20th century. In the U.S. the common denominator is the bread. In all types, it is an oblong bread roll as opposed to sliced bread. 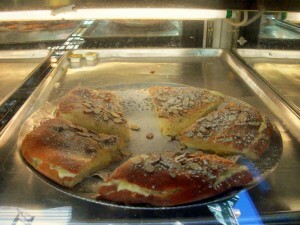 In Europe this type of sandwich is served on a baguette or a ciabatta. Some say that the sub or submarine originated in Groton, Connecticut, where there is the largest United States Submarine factory. The sandwich was commonly eaten by workers in the naval yard. So many terms for this sandwich, depending where you are from. For example, the term hoagie came from Philadelphia. Hog Island was a shipyard where emergency shipping was produced for the war effort. It has been said that the Italians working there during WWI introduced the sandwich. At the time it was made out of a variety of meats, cheeses and lettuce between the bread. 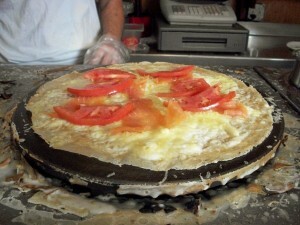 It became known as the “Hog Island”, the “Hoagie”. All in all, subs, submarines, hoagies and other similar ones can now be found worldwide. I came into Casapulla’s and I found a well lit place, super clean. 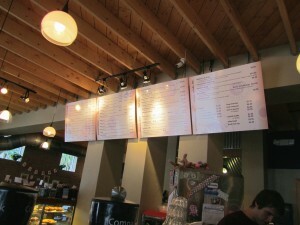 Ordering is done on one side of the counter with plenty of boards showing what they have to offer. I met Tiffany. I don’t know why but I always ask…if you are here eating for the first time what would you order? She knew her menu well. She mentioned the Italian, and one of her favorites, the Chicken Cheesesteak (with fried onions), and I wanted to also try the Turkey Stuffer. So, I had all 3. The Italian with everything on it; the works. The chicken cheesesteak was a 6 inch but the other 2 were 10 inches each. While I was waiting for my subs to be ready I checked the store even more. 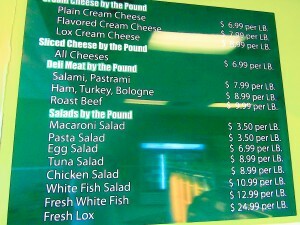 You can buy deli meats (Boar’s Head) by the pound. 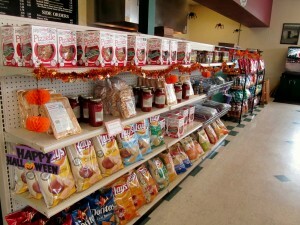 Available are a wide assortment of chips. And, they also had pastas, sauces, and pizzelles, as well. There is a freezer in case you just don’ t feel like cooking. It has sausage and peppers and other goodies all homemade. Some of those pastas and sauces could certainly be a great addition to the prepared food. Easy or lazy cooking, whatever you want to call it. There was a new item on the menu this summer. 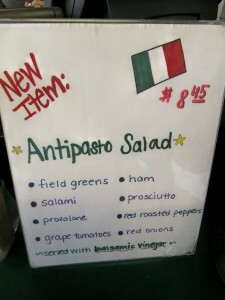 It is an Italian salad which has all the ingredients of the Italian sub, except the bread. Their menu is extensive. You can check it out on the above mentioned website. They have party platters. They also deliver lunch to your office from Monday through Saturday. For the Georgetown and Millsboro area, please call them between 8 a.m. and 10:30 a.m. For Lewes and Rehoboth call between 8 a.m. and 2 p.m. Please remember that delivery charges are applicable. Again, their number is 302-227-subs. Now to my tasting in the privacy of my own home. I would not have dared to sit at Casapulla’s with 3 subs. I could have encountered a friend or someone else that might have thought I was going nuts. Sub #1 – The Turkey Stuffer – Juicy store-cooked turkey breast with creamy mayo, savory stuffing and whole berry cranberry sauce. Thanksgiving year-round. I thought it was delicious. Who would not like this one? The combination of the cranberry, the turkey and the stuffing was perfect. I must tell you that I loved the size of their sub roll. It was not overpowering at all. You were able to take a full bite of the sub and experience everything there without spilling all over the place. I had to open it so that you could see it better inside. 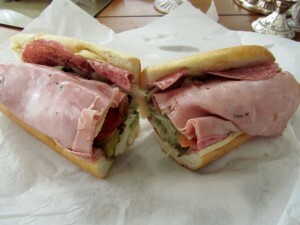 Sub #2 – The Italian – I like an Italian sub all the time. It is one of my favorites. Again, it was a good true Italian sub with all the trimmings. Genoa salami, capicola, pepered ham and provolone. Sub #3 – Chicken Cheesesteak – Warm, cheese melting, fried onions. What can I say? Thanks Tiffany. It was definitely good. Paula, Mike, their kids, and their entire staff are friendly….the staff saw me taking pictures and graciously smiled…probably wondering what the heck is she doing. I almost forgot to tell you. You do believe me that I did not eat all that food. I was frantically calling my neighbors to pass on to them the other halves. Nobody was home until later. I did find takers; Bill and Sharon. Talk to you later….if you are driving out of town….have them prepare some subs to go…easy. P.S. Some of the information for this post was taken from Wikipedia. It started when Lorenzo was visiting. Out in the back we were, eating crabs, and there he came in, bearing a beautiful Mini Smith Island Cake. Thank God it was a Mini; enough for everyone to have a slice. I could have eaten it all myself. It had also been a few days since a friend mentioned Hamel’s in passing. At first I did not know what she was talking about. Let me refresh your memory; you will recognize it immediately. 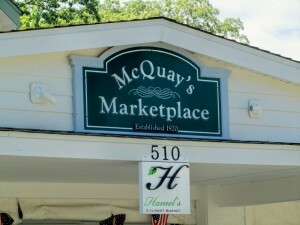 Years ago, before Farmers’ Markets made a comeback into the lives of all of us, there was McQuay’s in Rehoboth Beach. 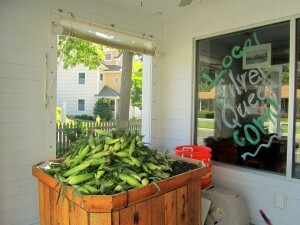 It was one of the first places you saw as you came into downtown Rehoboth. 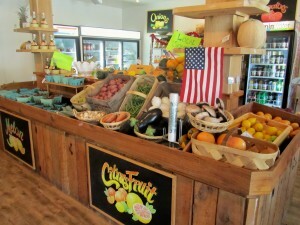 Fresh tomatoes, corn, blueberries and general produce, beautifully displayed. I even think that you could have an account. It really was the place to go. Fast forward, the building is still there, even the name has been left on the building; honoring what it used to be and trying to fill its old shoes. 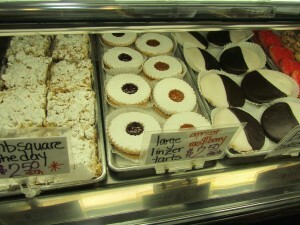 But, Hamel’s Gourmet Market is making this old market proud. 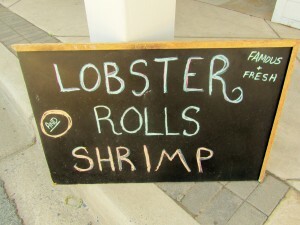 Hamel’s is located at 510 Rehoboth Ave., Rehoboth Beach, DE 19971. Tel. 302-227-3386, It will be on your right hand side as you are coming into Rehoboth, past the bridge, across from the Chamber of Commerce, and just before the roundabout. I decided to stop by and check it out. Immediately, I saw Chad. I have know him for a long time; him being one of my sons’ friends. He is the Executive Chef for Hammel’s Gourmet Market. He has been in the food business for years. Always loved to cook. You can call Chad Travis for catering and anything you need from Hamel’s at the above mentioned telephone number, or you can e-mail him at ctravis_fl@yahoo.com. 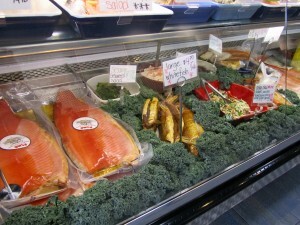 Hamel’s is a full service gourmet market, with a wide selection of fresh baked specialties, including turkey, ham, and roast beef. 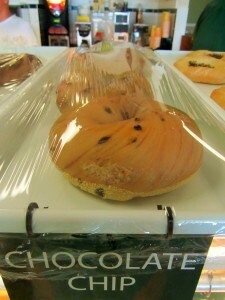 The pastries and breads are made locally, as well. 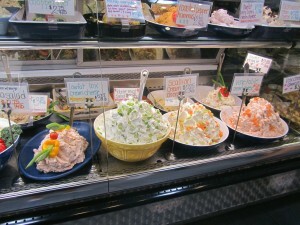 Prepared salads can be bought by the pound; lobster, shrimp, spicy tuna, tuna, egg, chicken, curry chicken with dried cherries, shrimp ceviche, cole slaw, among others. They call them Something Special Sandwiches. 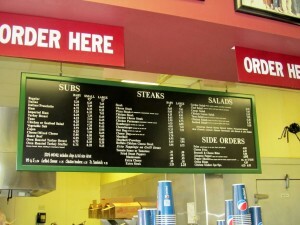 These are the sandwiches that Hamel’s is well known for and at the top of the list is the Lobby. This is a lobster roll sandwich with plenty of lobster salad on a fresh baked Milano roll with lettuce. Hands down, it is the favorite. Others are a shrimp salad sandwich, Anthony’s Favorite which has Citterio Prosciutto on a Milano roll with homemade pesto basic dressing, mozzarella cheese, lettuce and tomato. 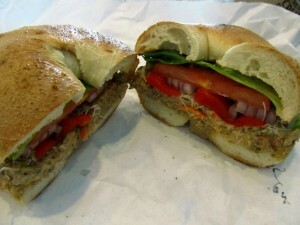 Then, the South Philly is a roasted pork, provolone cheese, and roasted peppers on a fresh baked Milano roll. If you do not want to cook or have some of those unexpected guests coming for dinner, please give them a call. Their steaks, seafood, ribs, burgers, hot dogs, and chicken are grill perfect. A sample of their prepared foods would be lasagna, mac & cheese, sausage and peppers, meatball sausage and peppers and so much more. Stop by and get a take-out menu. You have to meet Chad. 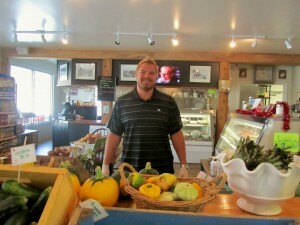 He is passionate about his cooking and has lots of plans for Hamel’s. Chad is planning to have, on selected Saturdays, a few demonstrations. 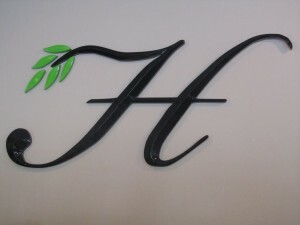 Hamel’s is not large enough to hold classes but something like a knife skills demo will be doable. Music? Chad is planning that, as well. Chopping or mincing? Learning the basics? Knife skills are one of the most important parts if you enjoy the culinary arts. There is more to it than just cutting. I decided to buy some pesto, which by the way tasted delicious. And, beer cheese which was like a triple threat with three cheeses; a nice kick to get you taste buds going and very spreadable. 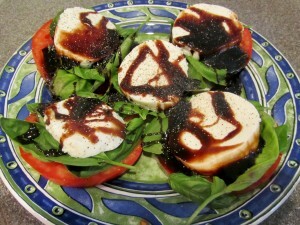 Then on my salad I put the cherry balsamic vinaigrette, which Chad also made. My son made the salad of fresh tomatoes from Freemans, mozzarella from Giant and fresh basil from my garden. The drizzle of this vinaigrette was delicious; the sweetness complementing the rest of the flavors in those fresh vegetables. I notice the potato chips; locally made, as well. They were called Cape Seasonings. Website? 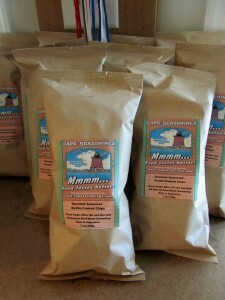 www.capeseasonings.com. 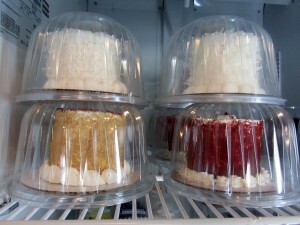 The Mini Smith Island Cakes are there to tempt you. 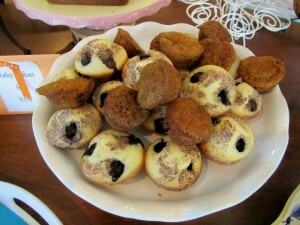 Cupcakes, also made by them are available, as well. And like that wasn’t enough, there is also gelato from Gelato Gal. 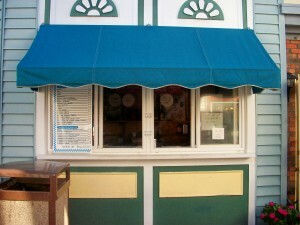 I wrote a post on Gelato Gal on 8/11/10. If you want to see it just click on the month of August of 2010 and scroll down to the date. 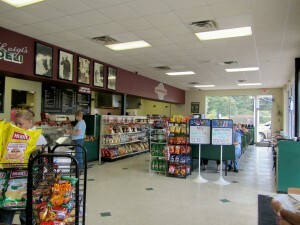 Hamel’s looks so inviting. The produce is perfect. If you want you can linger with some coffee or a soft drink; sit outside because there are a few tables available. Over a week ago, Trish said to me, as I was walking my neighborhood, that she was going to get bagels from the new place located at Midway. I did not know there was a bagel place there. But, I did find out that they opened 3 months ago. Put it in the back of my mind as a possible post for my blog. I also have a friend that eats a bagel and a banana every single day. I, on the other hand, hardly eat bagels. Therefore, I am no expert. Bagels were brought to the U.S. by immigrant Polish-Jews. In 2008, Gregory Chamitoff, an astronaut, was the first person known to have taken 18 sesame seed bagels into space on his 2008 Space Shuttle mission to the International Space Station. 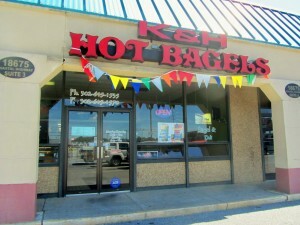 Today, I decided that K & H Hot Bagels was the place to check out. 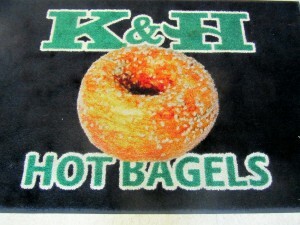 First of all, K & H Hot Bagels is located at 18675 Coastal Highway, Rehoboth Beach, DE 19971. It is the same shopping center where the Midway Movie Theaters are located, Rt. 1. Tel. 302-645-1535, Fax 302-645-1570. Plenty of parking available at all times. They open 7 days a week. Mondays to Saturdays from 5 a.m. until 5 p.m., Sundays from 6 a.m. until 4 p.m. I spoke to Herberth Loaiza. He told me that his alarm wakes him up every day at 3:00 a.m. Yes, that early. 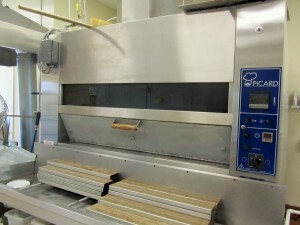 All bagles are baked in the premises. No preservatives are added; everything is 100% natural, no fat, and no cholesterol. 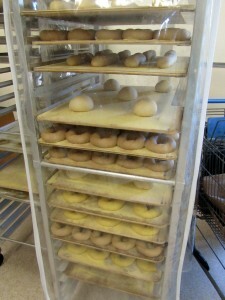 They also make bialys, which are small rolls that are a traditional Polish dish. 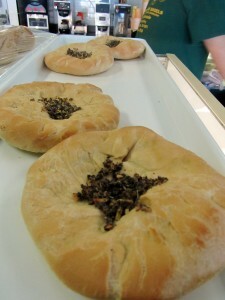 They are similar to a bagel but instead of being boiled before baking, a bialy is simply baked and there is no hole in the middle; a depression instead. 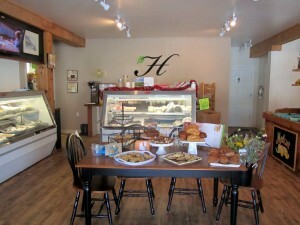 Herberth told me that they also bake pastries and muffins. Breakfast is served all day. 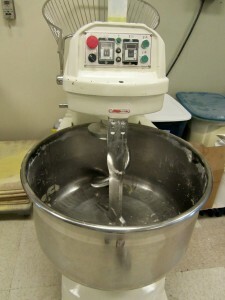 But, the restaurant also has homemade soups, which are never frozen. 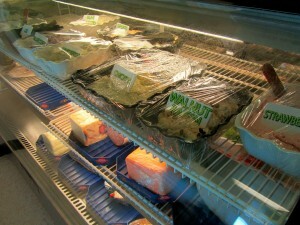 Available are also gourmet salad sandwiches, premium cold cut and cheese sandwiches, wraps,and fresh salads. Some from the grill, like cheesesteak hero, chicken cheesesteak, tuna melt, grilled roast beef, onions, mushrooms and gravy, among others. You can also call or fax your orders in and they will have them ready for you. I bought an everything bagel, a roll and a sundried tomato bagel. I decided to eat the sundried tomato bagel and I found it to have a nice crusty outside and a soft middle. I even ate it plain. 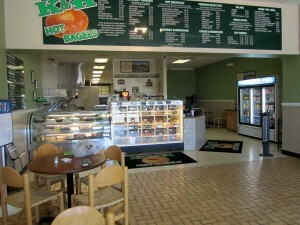 K & H Hot Bagels have coffee and cold drinks. Tables are also available in case you want to sit down and take a break. It was time to go but not before I was able to take a peek at their kitchen which had bagels and other goodies resting until it was time to be baked. Let me know how you like them. And, remember that they do sale retail and wholesale. Note: Information for this post was obtained from http://en.wikipedia.org. Talk to you later….what a beautiful day it was….the visitors must be having a ball!! To me, there is no life before coffee. I love it in the morning and there are times when I enjoy it in the afternoon, as well. More so on a chilly day. I consider it a ritual since I drink it every day. 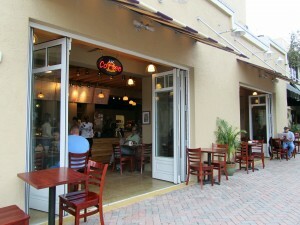 Just opened a few weeks ago is the newest addition to the eateries in trendy Atlantic Avenue in Delray Beach. SPoT Coffee is their name. Located at 44 East Atlantic Avenue. Tel. 561-455-4041. Website? 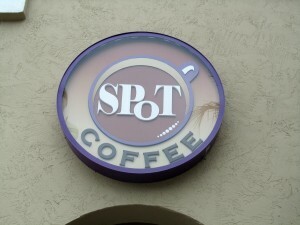 www.spotcoffee.com. You can find them on Facebook and Twitter. I went to check it out because they have been working on that corner for quite some time; teasing us with “soon to be opened” signs. Was it going to be the place to go for coffee or just another coffee shop? This company’s offices are in Canada and New York. In existence since 2004. Delray is not only a destination for vacationers, but for new businesses, as well. I wanted to try their coffee because it seems that there are so many coffee shops in every corner of every city, but a lot of them over-roast their coffee; giving it a sour taste. 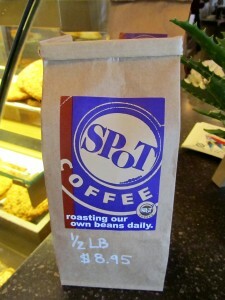 SPot Coffee is in a great corner. Its doors open to the sidewalk and tables are scattered around. 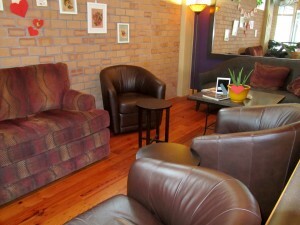 There is also a cozy corner with sofas in case you want to make yourself feel at home or read the paper. 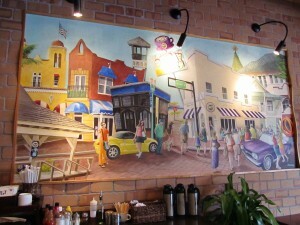 Art depicting Atlantic Ave. is also on their walls. The coffee selections are on a top board. I decided to have a Mocha. The Mocha is only prepared with whole milk. I could not wait to taste it because so far this year I can say that the other great cup of coffee I have sampled was at One World Cafe in Baltimore, Maryland. I did not have to wait long and I can say that it was delicious. I sat outside and really enjoyed it. Creamy, nice and hot; great aroma. 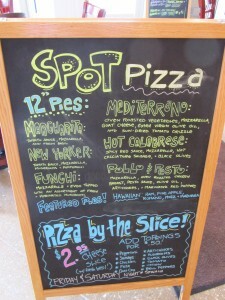 Besides coffee, SPoT Coffee also offers other beverages, baked goods, signature sandwiches like focaccia sandwiches, wraps and pizza. A blackboard is posted every day with their offerings. I only can vouch for their coffee, at this time. Did not try anything else. It is so good to have so many choices and to see the patrons enjoying themselves. I wish them much success. 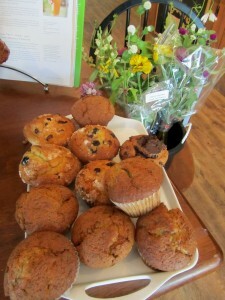 Please note that SPoT Coffee also has coffee for sale and catering is available. About 6 or 7 years ago I went with Shelley and Scott to this New York Style Deli Market called Way Beyond Bagels. 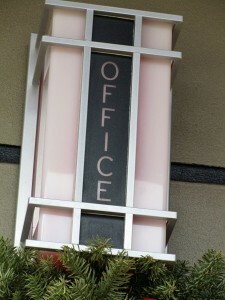 It is located at the Shoppes at Addison Place. The address is 16850 Jog Rd., Delray Beach, FL 33446. Tel. 561-638-1320. 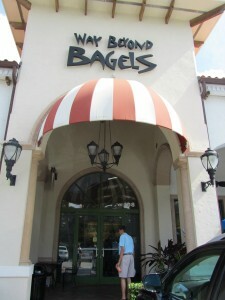 The website is www.waybeyondbagels.com. This area is called “county club mile” because if you drive on this road, all you will pass is one country club/gated community after another. 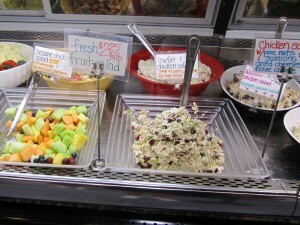 I always used to get their chopped liver and their waldorf chicken salad; my mouth was just watering thinking about it. Since we were out and about it was the perfect place to stop and get a bite to eat. I have not been there in quite some time. You do need a car since you have to go west from downtown Delray Beach. I took Atlantic Avenue to Jog. Then turned left and went about 1 mile. You will see it on the left hand side of the road. It is always crowded; very popular. They open Mondays to Fridays from 6:30 a.m. until 5:00 p.m. and Saturdays and Sundays from 6:30 a.m. until 3:30 p.m. When you step in all you see is beautiful food every where. 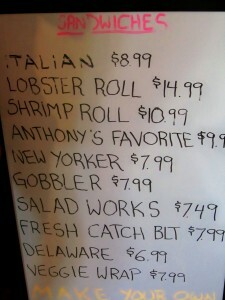 It really is a New York Style Deli Market. Everything looks so fresh. 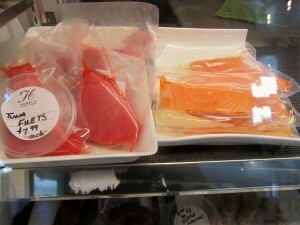 They carry Brooklyn’s finest smoked fish like nova, belly, sturgeon, sable, chopped nova, whitefish, scotch salmon and baked salmon. 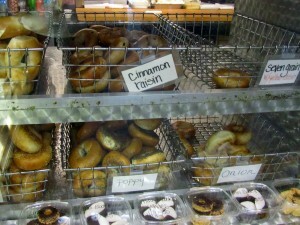 They have about 2 dozen different bagel flavors, and hand whipped specialty cream cheeses. 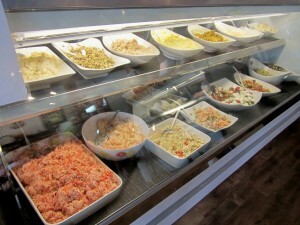 They have salads and ready to go salads, soups like split pea and chicken noodle. 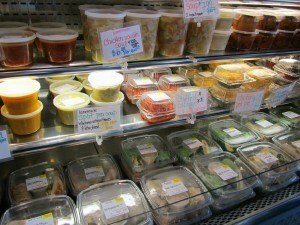 The day I went they also had chicken pot pie, stuffed cabbage and wraps all ready to go. 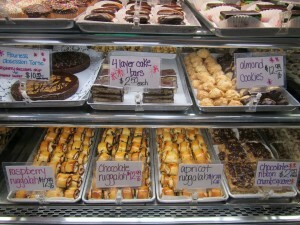 I almost forgot to tell you that they have a great assortment of baked goods. For example, the cookies looked great but I did not get any. I cannot tempt myself that way. 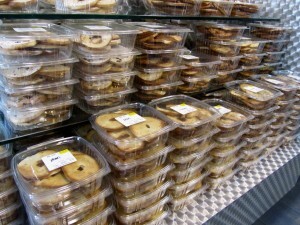 They had mini linzer tarts, and ruggalah, muffins, homemade chocolate flourless torte, homemade chocolate peanut butter flourless torte, just to name a few. 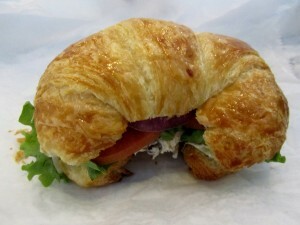 We ordered one croissant sandwich with waldorf chicken salad. It was delicious. Mine was a plain bagel with chopped liver and the works. It was just like I expected it to be; fantastic. I even bought chopped liver to go. 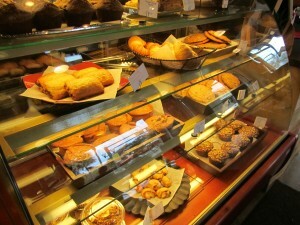 It is one of those places that you can come for breakfast, lunch or even stop and get something for a light dinner. There is a self serve dining room and also outdoor seating. The outdoor seating is so popular that it really was hard to find an empty table, therefore, we ate inside. 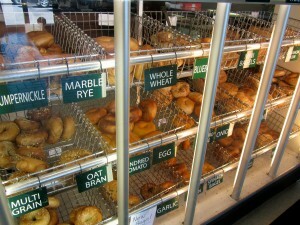 Way Beyond Bagels caters, but please call them or go on their website above mentioned for more information. They offer free delivery on all orders above $125.00. I am going straight to the point. 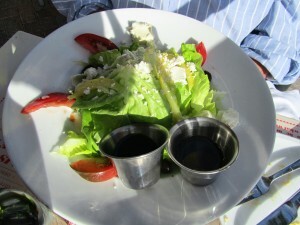 I had the best salad at The Office, located at 201 East Atlantic Ave. in Delray Beach. The telephone? 561-276-3600 and the website is www.theofficedelray.com. I have told you many times that one of the most pleasant ways to eat is “al fresco”, especially on a gorgeous day. That’s what happened when my husband and I decided to get something for lunch during our stay in Delray in one of the very popular restaurants on trendy Atlantic Ave. I wanted to see how The Office was doing. They opened about a year ago and on 1/16/10 I wrote a post on this blog. You can just click on the month of January 2010 and scroll down to the date. 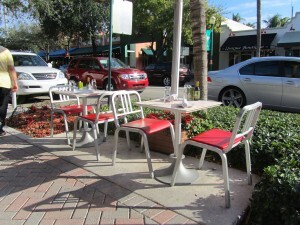 The Office has a great corner in Delray; visible and plenty of outdoor dining. Two of their outdoor tables take “dining al fresco” seriously; practically on the street. I have sat on one of those and have enjoyed it so much. On this day we sat outside, as well. As I sat down I noticed that the people on the next table were having a beautiful salad. So when our waitress came and I asked she said that it was not on the menu; it was a special that day but that people were really liking it. Of course, I had to have it. I topped it just like those other people, with steak slices. My husband ordered it without the steak and just with olive oil and vinegar. Mine had a light Balsamic dressing. Let me describe it to you. It was a Boston Lettuce. This lettuce is also known as Tom Thumb, Bibb, Butter, and Buttercrunch and is one of the 6 lettuces generally available for human consumption. It is a member of the butterhead family; velvety, butterlike texture of the leaves and truly delicious. 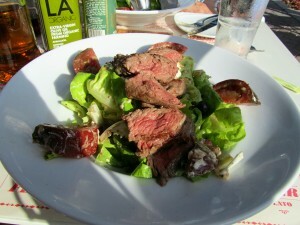 The salad also had a goat’s milk feta cheese and it also had very thin slivers of preserved lemons. The rind of the lemons is preserved for some time; afterwards, all you get is this lemony taste adding texture, color and flavor to the salad. The combination of all those ingredients with the steak just left me wanting more. I hope they put it on the menu. 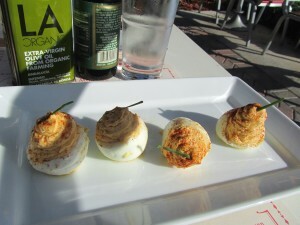 We also ordered their Truffled Deviled Eggs with paprika and chives. Again, the deviled eggs were just as good as before, if not better. We spent a few hours eating, chatting, and people watching. Nothing out of the ordinary; just a pleasant afternoon with good company in this Village by the Sea. Talk to you later…..almost getting to the Christmas tree….have a good one!! Note: Information for this post was taken from www.wisegeek.com. What a gorgeous day it was, yesterday, at the Delaware Beaches. 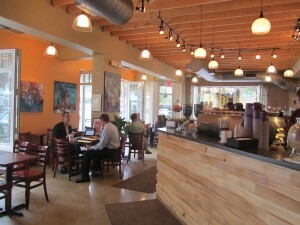 I decided to go to Rehoboth and check out Cafe Papillon. Then, I encountered a multitude of people. Yes, they will be there today too looking for bargains on the sidewalks of Rehoboth Beach. I had forgotten that this week-end was the sidewalk sale. Downtown merchants in Rehoboth clean out their stores and everything pretty much goes on sale. No, it is not my thing. That’s probably why I did not give it too much thought. Anyway, I had to park two streets over south of Rehoboth Avenue. Rehoboth is a small town so it was easy walking. Lots of people walking the Boardwalk, as well. 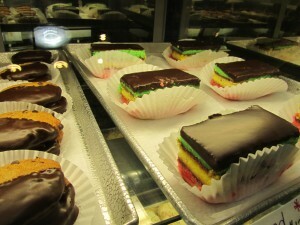 Cafe Papillon is located at the Penny Lane Mall, 42 Rehoboth Ave., Tel. 302-227-7568. 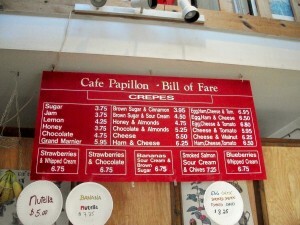 Website is www.cafepapillon.com. 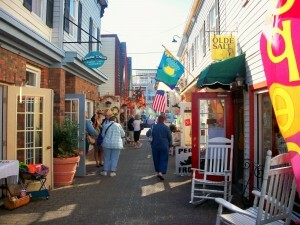 The Penny Lane Mall is a small alley full of shops that connects Rehoboth Ave. with Wilmington Ave.
Cafe Papillon is right in the middle of the mall. 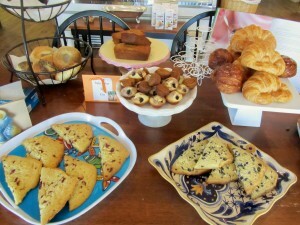 It is an authentic French Cafe and if you speak French, well, you will be right at home. 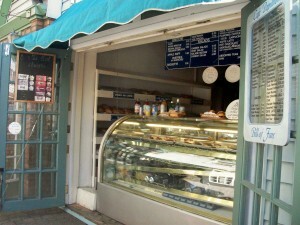 On one side you will find the patisserie where French baked goods are sold. Salads and sandwiches are sold there as well. Coffee and Beverages? On that side also. Everything is made in-house. 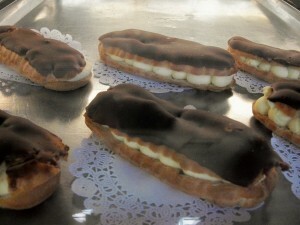 I was gazing at the tropezienne, fruits tarts and eclairs, but just got coffee. 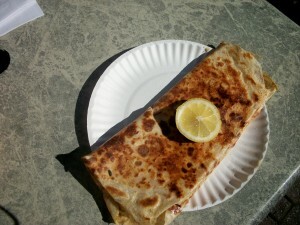 I was waiting for my crepe. 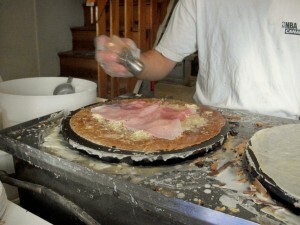 A tropezienne is a creme tart that takes a long time to prepare. It was developed in St. Tropez using local ingredients. The creperie is on the other side and it is strictly for the purpose of ordering and cooking the crepes right there in front of you. Different crepes were ordered. One was a ham, cheese and tomato and the other an egg, smoked salmon and tomato. I was watching him make the crepes and at the same time I wondered what he thought I was doing. Every time he added an ingredient I took a picture. He really did not mind, he told me so. I could not wait to eat it. Outdoors at the cafe was perfect; a sunny, cool, autumn day it was. Sitting al fresco, enjoying our breakfast made us feel we were somewhere else and not one block off the Atlantic Ocean. 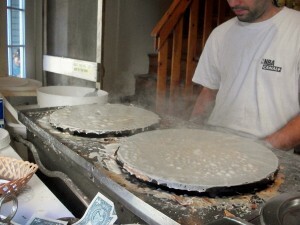 Of course, we had to have a dessert crepe. 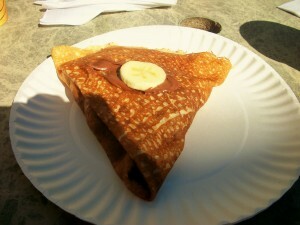 The suggestion was the Nutella and Banana Crepe. Nutella is a hazelnut base spread very popular in Europe and I think fairly popular here in the States, as well. The combination of the fruit and the spread was delicious. Just as we finished we took off for a long walk; had to. I don’t need to explain why. Have a great day!! Talk to you later…. 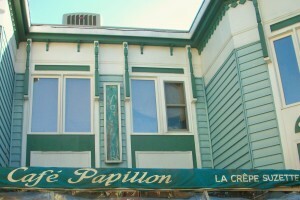 Note: Cafe Papillon is only open on week-ends now until October 17th and then is until next year. Another thing to remember is that they only accept cash.